Gods of Gold is the new novel by the ever popular local author Chris Nickson. Any fans of the novels about Richard Nottingham, Constable of Leeds in the 1700s, will be looking forward to meeting Chris’s new detective and finding themselves transported to 19th century Leeds, with ‘its atmosphere of grittiness and extremes of power and powerlessness’. Detective Inspector Tom Harper makes his debut and takes on the mantle of championing the law and seeking justice with all the challenges inherent in Victorian Leeds. June, 1890. Leeds is close to breaking point. The gas workers are on strike. The supplies are dangerously low. Factories and businesses are closing; the lights are flickering at going out. Soon the place will be at a standstill. Detective Inspector Tom Harper has more urgent matters on his mind. The beat constable claims eight-year-old Martha Parkinson has disappeared. Her father insists she’s visiting an aunt in Halifax – but Harper doesn’t believe him. And when Col Parkinson is found dead the following morning, the case takes on an increasing desperation. 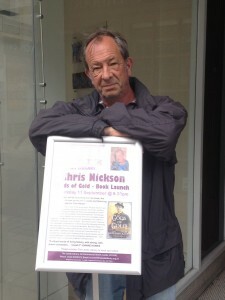 The book launch for Gods of Gold will be at The Leeds Library, Commercial St. Leeds. 6.30 pmSeptember 11th. Contact The Leeds Library to reserve a place. Chris will be at Ardsley and Tingley Library on September 24 at 2pm. Free, all welcome. This entry was posted in Book Reviews, Books, Crime, Historical and tagged Book Reviews, Chris Nickson, Crime, Gods of Gold, Historical, leeds. Bookmark the permalink.